Whittemore Gulch Trail is a singletrack trail in Purisima Creek Redwoods Open Space Preserve that is open to mountain bikes. It's easily one of the most beautiful singletrack mountain biking trails on the Peninsula. This ride is a mixed loop (singletrack, fire road, and road) aimed at descending this trail. If you live close to Highway 1, this ride could be started from the Purisima Creek Road trailhead, so that you'd be climbing Purisima Creek Trail first and descending on Whittemore Gulch later. I'd prefer to do it like that myself, but I don't live in that area and it's more convenient for me to start from Skyline Boulevard. So, that's what's reflected in the route described on this page. This is less desirable, in my opinion, because you have the fun first and the payback comes later. If you'll be parking on Skyline Boulevard, you'll have a choice between parking at the trailhead closer to Whittemore Gulch Trail (PC01 on the park map) or the one near Purisima Creek Trail (PC03). Skyline Boulevard is a road where plenty of sports bike riders and fast car drivers go on "joy rides", so I'd recommend picking your parking spot based on when during your ride you could be riding on Skyline in the safest manner. For example, if your return to Skyline might be close to dusk, you might want to park near Purisima Creek Trail and ride Skyline first, so that you don't have to ride on it last, as darkness is falling. Similarly, if you'll be starting early in the morning, it might be better to ride the Skyline portion first, while the traffic is still very light. Alternatively, if it's early in the morning but a densely foggy one, it might be better to leave Skyline for later, so that the fog might be lifted by the time you climb back up Purisima Creek Trail and have to get on Skyline. I should let you know that Whittemore Gulch Trail is subject to seasonal closure (though the fire roads in the same preserve usually stay open year round). So, be sure to check the current trail conditions at the park website (whose link you'll find on the left) before you plan a ride that includes this trail. At the start of the unpaved portion of this ride, on North Ridge Trail, there will be some steep descending, as can be seen just past the 2-mile mark on the elevation plot above. Despite being a fire road, this descent, hovering around a -20% grade (and even steeper in at least one spot), not only could be intimidating to inexperienced riders, but it can be a bit hairy even for experienced ones if the trail happens to be covered by a fresh layer of gravel, in which case it becomes considerably slippery. This descent ends at the junction with Harkins Ridge Trail, after which you continue fairly flatly until the start of Whittemore Gulch Trail. Whittemore Gulch Trail is a non-technical, smooth singletrack that descends quite consistently and, at times, playfully for more than 2.5 miles. With the exception of a few spots, it's not a very narrow trail and shouldn't be intimidating to beginners from that point of view. Its first 2 miles descends at an almost constant grade averaging around -10%. Its first few switchbacks are open to views of the surrounding hills and of the ocean. As you get lower, you enter dense tree cover. When the trail reaches the creek bed at the bottom of its namesake gulch, the descent becomes less even, and you even need to pedal up a couple of (very) short stretches. Within its last half mile, the trail changes personalities and the descent becomes steeper and somewhat technical. This short portion has stretches that are steeper than -20% grade, and beginners will need to be careful here. When your descent ends near the gate (PC05) on Purisima Creek Road, the only thing waiting for you is the unbroken climb back up Purisima Creek Trail. This is a serious climb. It lasts for 4.5 miles and, although the slope begins at very modest levels, it keeps gradually increasing for the first 3.5 miles of the climb. At its steepest, there's a quarter-mile stretch of this fire road where the grade averages 15%; and that's not the only stretch that hovers around that grade. The last mile of the climb somewhat slackens to an average of around 10% grade, but the slope isn't very even. The trail won't stop challenging you until you reach pavement on Skyline Boulevard. One obvious option for extending this ride is to include the side loop over Borden Hatch Mill Trail and Grabtown Gulch Trail on your way up Purisima Creek Trail. This will add 4 miles and an extra 1200 feet of elevation gain to your totals. 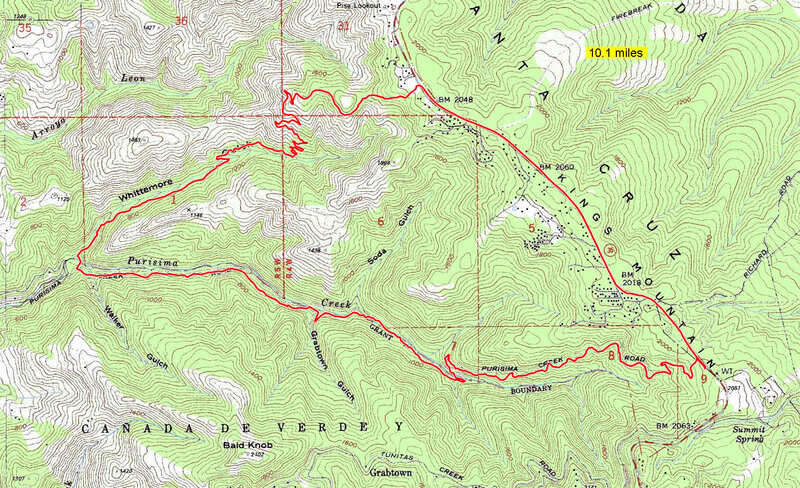 Another possibility is to continue into Skeggs Point (El Corte de Madera Creek Open Space Preserve), by taking Borden Hatch Mill Trail to Tunitas Creek Road, turning right onto Star Hill Road and following that to one of the trailheads. (Refer to the multiple suggested rides in that park available on this site.) That typically pushes the ride length into the 20-mile range, and I've never had the physical condition to allow me to do that on trails of this grade. But, if you do, you can have a full day of first-rate mountain biking here by doing that.